‘Tis the season! As the temperature drops and the holidays near, that means ample occasions to don our best festive frocks. If holidays with the in-laws are part of those occasions, then read on for a foolproof guide for tackling the events in style. Nothing says “comfortable with the in-laws” more than jeans and a cable knit. 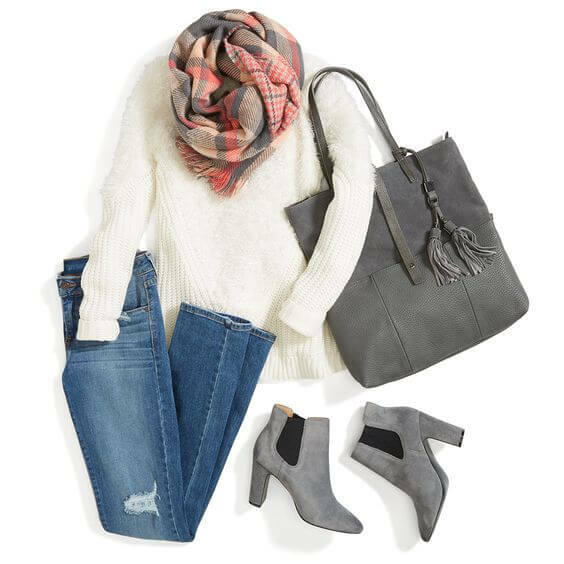 Keep your look comfy and casual by reaching for your favorite distressed denim, topped with a chic, cozy pullover. Try a winter-white color this holiday season, and don’t be afraid to play with texture —think chunky knits, wispy feather knits, and faux leather accents. If you’re still in the phase of getting close & comfortable with the in-laws, try out workwear-inspired holiday wear. Toss on a pair of sharp black trousers as your base or opt for drawstring joggers to keep you ultra-comfy all evening long. A knit blazer or fitted jacket will keep it chic without feeling overly stuffy. If you’re not one to dress to impress anyone else, reach for something classic with a twist. Swap out your ultra-skinnies for a coated pair, i.e, faux leather style. Pair them with your tried-and-true button-down, slip on your comfiest pumps and layer on a faux fur vest to cozy-up your buttoned-up look. A sparkly statement necklace finishes the ensemble with the perfect dose of holiday glam. P.S. Don’t show up empty-handed! A bottle of wine, your best appetizer or a simple party favor can go a long way in starting the night off on the right foot. What will you be wearing to dinner at the in-laws? Tell us in the comments!